Finn has some music to face in the General Hospital spoilers. 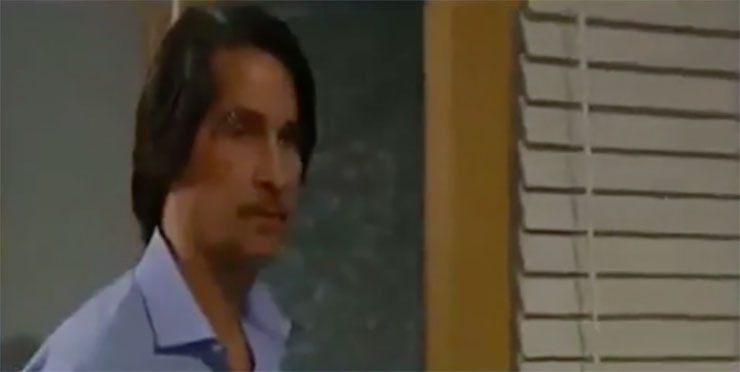 The General Hospital spoilers for Thursday, April 13th, predict that Finn has to deal with trouble in his professional life in addition to his personal life. That’ll be the day! Brad (Parry Shen) betrays Finn (Michael Easton) and the secret he knows about him. Later, Hayden (Rebecca Budig) sees Brad and asks him who’s getting fired. Sadly, Monica (Leslie Charleson) calls Finn in for a meeting in her office. She tells him she wants this meeting to be private. Nina (Michelle Stafford) sees Valentin’s (James Patrick Stuart) watch from his past life with Anna (Finola Hughes) on his wrist. She tells him she’s never seen it before and wonders where he got it. As Lulu (Emme Rylan) and Dante (Dominic Zamprogna) await Lulu’s first court-sanctioned visit with Charlotte (Scarlett Fernandez), Lulu notes that she’s sure Valentin has plenty of methods planned to ruin her first official bonding session with her daughter. Sonny (Maurice Benard) continues to go through the stages of grief Thursday. He moves from sadness to fury. And we all know that’s never pretty! Could he be triggered into a bi-polar depressive state by what’s going on with him and Carly (Laura Wright)? Andre (Anthony Montgomery) admits he had his heart broken too. But then he angrily asks Anna what the hell she’s doing. At the Metro Court, Ned (Wally Kurth) asks Olivia if she’s ready for a surprise. Olivia looks nervous. And she also worries about Dante and the many things he’s got going on professionally and personally!